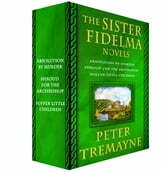 Peter Tremayne's Fidelma of Cashel mysteries, set in ancient Ireland, will delight readers with their confounding puzzles and brilliant characters. Here together for the first time are the first three books in the series. In A.D. 664, someone murders the Abbess Etain, a supporter of the Celtic way, during the synod between the Roman and Celtic churches. 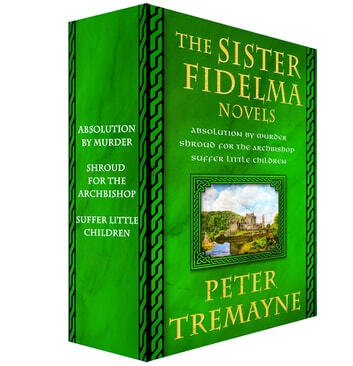 Sister Fidelma, of the Celtic Church, is assigned to use her legal training and mental smarts to find out who wanted the abesss dead, and why. Along the way she is paired up with Brother Eadulf, who belongs to the Roman Church, and it becomes immediately apparent that there might be more between them, as they work together to find the killer and prevent civil war. Sister Fidelma and Brother Eadulf travel to Rome to deliver a message to his Holiness. But then the Archbishop is found dead, strangled in his chambers, and a monk is observed fleeing the scene of the crime. Convinced of the monk’s innocence, Fidelma pledges to help reveal the truth, but instead she stumbles across far too few clues, an abundance of motives, and a trail that is strewn with bodies. Fidelma, sister of Colgu, who has just become the king of Muman, the largest of the five Irish kingdoms, is tasked with solving the mystery of who murdered the Venerable Dacan, a highly respected elder from a nearby kingdom. This death has far-reaching implications for the peace between the kingdoms, and Fidelma must work to find out what happened to Dacan before a bloody war breaks out between the many factions and families of sixth century Ireland. Thoroughly enjoyed these novels as in the spirit of the Cadfael novels. Enjoy learning about the historical adpects of life and politics in seventh century.